InPrint USA Meets Demand. Innovation and Demonstration in 2019 . From personally designed floor-to-ceiling wallcoverings in the living room, to decorative laminate flooring in the kitchen, the décor industry is expanding its capabilities to satisfy high-volume production while reaching consumers on a personal level. Responding to this growing demand for self expression are manufacturers and material suppliers who look to leading digital print providers to deliver solutions. The InPrint USA exhibition highlights industrial print in manufacturing and continues to be the premier platform dedicated to this technology and innovation. As we prepare for the InPrint USA 2019 show on April 9 to 11 in Louisville, KY, we address a few important questions—how do you define industrial print, what applications are seeing success with this technology, and at what pace? Above: The InPrint USA exhibition and conference is held April 9 to 11, 2019 at the Kentucky International Convention Center. MManufacturers look to leading print providers for equipment and education on a wide range of applications. The InPrint USA exhibition meets this demand by segmenting the show into three key applications—functional, packaging, and decorative. We define functional printing as enabling a product’s functionality through digital, inkjet, or screenprinting. Latest advancements in these printing processes have enhanced production of conductive inks, sensors, touch pads, circuit boards, printed electronics, and RFID tags. Industries served and present at InPrint USA are automotive, aerospace, medical and pharmaceutical, smart wearables, and security. Package printing is one sector seeing growth with industrial print technology. Known as an umbrella term for a wider range of applications, industrial print for packaging includes printing on folding carton, flexible packaging, and corrugated. Flexible packaging in itself pertains to various materials such as bags, pouches, labels, and wraps. Brand managers, designers, as well as packaging converters in food and beverage, spirits, and consumer goods attend InPrint. Décor printing is another term with many classifications. From interior décor and fashion, to printing on any flat, curved, or rigid surface, the process is defined as any design digitally printed on an object for decorative purposes. Ironically, this process can apply to every segment so the emphasis weighs on specific substrates including textiles, wood, glass, ceramics, metal, and plastic. The possibilities are endless and print suppliers are meeting demand. In October 2018, InPrint and research partner I.T. Strategies—a leading independent strategic consultancy specialized in industrial digital printing, inkjet technology, and early market development practices—published a report on the growth of industrial inkjet technology. 115 respondents were asked their opinion on a variety of questions related to the challenges and opportunities of industrial inkjet. Results compared very favorably from a similar survey conducted in 2017, highlighting an increase in confidence that significant growth will take place throughout the next 12 months. According to the survey, respondents named décor and packaging as the industries with the most immediate opportunity within industrial inkjet technology. Over 50 percent of respondents surveyed chose functional printing as the most technically challenging within industrial inkjet. Nevertheless, most believe the growth curve for industrial inkjet technology is either in the fast, early development stage or steadily growing. Respondents also ranked North America high as a market showing strong growth potential for industrial inkjet. Helping connect that North American industrial print market with manufacturers is one of many reasons InPrint USA show management selected Louisville, KY as its location for the 2019 exhibition. InPrint visitors consist of brand owners, CTOs, R&D directors, production developers and designers, and end users. Some key companies who attended last year’s show include Boeing, Coca-Cola, GE Appliances, Hallmark, Kimberly Clark, Nike, and Proctor & Gamble. To help identify key visitors, InPrint established new partnerships with leading end user groups for the 2019 show, proving the need for a dedicated forum of print in manufacturing. To date, these include the Flexible Packaging Association, Kentucky Automotive Industry Association, National Association of Printing Ink Manufacturers, National Graphene Association, and Wallcoverings Association. New show features at InPrint USA 2019 promise to deliver opportunities for education and engagement on the growth of industrial inkjet, as well as digital, specialty, and screenprint solutions for manufacturing integration. Whether visitors are new to the industry or have been in it for a while, there is something for everyone to take away from the event. Located on the show floor, Ask the Experts provides InPrint USA attendees with complimentary consultations with some of the industry’s most accomplished professionals. Craig T. Reid is the founder of CTR Resources, LLC, where he helps original equipment manufacturers (OEMs), end users, component manufacturers, and industry organizations with research, product development, channel strategy, sales and marketing, as well as business process improvement. With more than three decades of knowledge and experience in graphics and imaging, the past 20 years he focused on inkjet technology, developing and driving innovative solutions that have helped propel the use of inkjet for more print and decoration applications. Deborah Corn has over 25 years of experience working in advertising as a print producer. She currently provides resources to print and marketing professionals through Print Media Center, and works behind the scenes with printers, suppliers, and industry organizations helping them create meaningful relationships with customers and achieve success with their social media and content marketing endeavors. John Sillies is the EVP at Graphic Systems Services (GSS) where he has worked for the past 23 years. He has 40 years of experience in the graphic arts and printing industry. Sillies started his career in 1978 as an R&D engineer for Harris Corporation and has held management positions at AM Graphics and Baumfolder prior to GSS. InPrint USA is co-located with ICE USA, which is the International Converting Exhibition. Both shows established a new partnership with the Flexible Packaging Association—an organization that has served as the voice of the flexible packaging industry since 1950. The Flexible Packaging Pavilion, located on the show floor, allows visitors of both shows to cross-educate on the latest flexible packaging solutions in the printing and converting industries. Presenting all three days of the InPrint Conference, I.T. Strategies’ Hanley provides a strategic review of realistic development potential across three market segments—functional, packaging, and decorative. Each day is dedicated to one of the three market segments and examined in terms of the opportunities for growth and introduction of new print technology it offers. The InPrint Conference runs concurrently with the InPrint USA show and is held at the InPrint Theater located on the show floor. 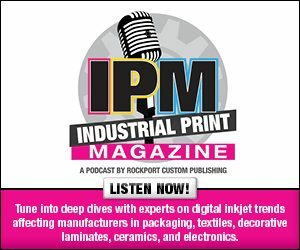 Returning to InPrint USA is IMI Tech Talks, where leading OEMs highlight the latest developments and challenges within industrial inkjet technology. IMI has been an organizer of conferences and courses for nearly 30 years, providing strategic and technical overviews of the digital inkjet printing industry. IMI Tech Talks operates within the InPrint USA Conference. New technologies and processes are constantly changing the print industry and any sector that interacts with it. Granted, it can be challenging to keep up with, but these evolving technologies keep designers, marketers, equipment suppliers, and integrators engaged and focused to stay in front of the print evolution. The same evolution that calls for meeting consumer demand, sustainability, creativity, and business growth. Anticipate engaging in all of these topics at InPrint USA. Christina Molina is part of the InPrint USA team based out of Chicago, IL.